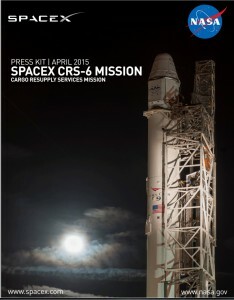 Meteorologists predict a 60 percent chance of acceptable conditions Monday for the launch of the CRS-6 mission on a SpaceX Falcon 9 rocket and the Dragon spacecraft carrying experiments, equipment and supplies to the International Space Station where astronauts will use the materials to continue their cutting edge research off the Earth, for the Earth. Since we’re still a few days from launch, there’s enough time to get all the details about the mission with the CRS-6 Press Kit. Countdown milestones, the path the Dragon will take to the reach the station and the vital research projects being carried are but a few of the interesting facts available in the press kit. Liftoff is scheduled for 4:33 p.m. EDT Monday from Cape Canaveral Air Force Station. The space knowledge is amazing for the scientis, but extraordinary amazing for the comun people, like me. Thanks to all of you, all specialty scientists, technicians, and brave astronauts, who have given soul, life and heart for the conquest of space and knowledge of our universo. Did anyone guess to themselves if Falcon would be able to make the barge landing last time? My guess was that Falcon would make some kind of contact with the barge but not stick the landing. My guess for the next launch is, (if the weather is good it will be a perfect landing with at least one leg touching the inner circle). I will be arriving to Orlando tomorrow morning and then I’ll be going to KSC on Sunday morning. I hope the weather will hold and improve for this mission. I hope that Space X not only delivers the Cargo, but provides us with a beautiful landing of the First Stage and thereby takes the next Giant leap for mankind. May i say….can I join NASA, Iam now senior citizen and have written manyscieitific articles. Maybe you can get something useful in me.